The story of a cute little dog heading out with the American troops to fight in the trenches during the First World War sounds like it would be a somewhat insensitive family film that used the horrors and bloodshed of this war to make a mindless little movie for children, but this is not mere fiction we’re dealing with here; Stubby was a real-life Boston Terrier who went on to become the most decorated canine in US military history, serving in 17 battles on the Western Front and even earning the rank of Sergeant after capturing a German spy. In other words, this dog was the real deal, and is now the subject of a new animated film documenting his numerous achievements, and while it is most certainly a film designed specifically for children, it not only treats the material with a great deal of respect, but it also gives the audience a good, digestible history lesson with its heart firmly in the right place while also acting as a nice and genuinely sweet movie in its own right. The movie follows Stubby – who mercifully doesn’t talk throughout the entire movie, one of many instances where the film actually seems to have actual respect for young kids – as he starts off as a mere stray wandering the streets of Connecticut in 1917 before he stumbles upon a US Army training camp, where he is taken in by young recruit Conroy (voiced by Logan Lerman) and becomes the mascot of the 102nd Infantry Regiment to which Conroy and his friends belong. Soon, the soldiers and Stubby are shipped off to fight the Germans in France where they team up with French soldier Gaston (Gérard Depardieu), with whom they witness first-hand (or in Stubby’s case, first-paw) the heavy toll this war is taking on everyone. Stubby, however, proves to be a useful asset by helping find soldiers wounded in combat, warning people of incoming mustard gas attacks, and finding and helping to capture a German spy, which earns him that high ranking of Sergeant. There’s a quote in the movie that I feel perfectly sums up the whole thing in general; it’s spoken by Gaston when describing himself, and he says (and you’ll have to imagine Depardieu’s thick French accent as you read it) “I’m not the most beautiful, but I’m strong and loveable.” This had a fairly low budget for an animated movie, around $25 million which is mere peanuts compared to some of the bigger players out there, and though it’s certainly true that the animation isn’t completely great – there are some parts where people move a little robotically – they still worked within their limits as much as they could, creating some lovely backdrops (or as lovely as you can get with it being the First World War) and often some stunning lighting and close-ups that add to the surprising tension this animated children’s movie gives off. They certainly animate the dog in a way that feels very believable, and because this is a character that doesn’t talk (again, thank God) the animators really had to render him in a way that his personality and whatever he may be thinking shines through via some exaggerated facial expressions, which definitely works because this is one cute dog who’s instantly identifiable as a character and adorable as hell. It courageously goes into as much detail about the trials and tribulations of being a soldier in this war as a film for children can go into; there’s no blood or gore (then again, what kind of sick individual expects that in a harmless movie like this? ), but death and danger is certainly felt around every corner, and the movie does a very good job at making you feel emotionally attached to these characters, so when one or more of them are injured in any way you’re actually hoping that they live to fight another day. There are a few intense battle scenes in the film which, again, shy away from the violence of it all, but it makes up for that with a strong emotional core, which is the relationship between Conroy and Stubby which you’d have to have a heart made of coal to not feel anything from how sweet it is. I mean, come on; the guy teaches this dog how to salute with its paw, and it’s the loveliest thing you’ll see a dog do in a movie all year – how could anyone not be immediately smitten from that point onwards? There are also expositional scenes that detail the progress of this battalion during the War, narrated by Helena Bonham Carter for good measure, which are presented in traditional animation, and it’s fascinating as well as educational for children as well as adults who didn’t know much about this particular side of military history, and what makes them extra special is how they give you the hard straight facts without talking down to the audience. You could legitimately show this film in a primary school history class, and the children would not only learn something valuable but also be entertained enough to want to learn more (which should put any teacher at ease; that way, they can sneak out of the classroom for a few minutes while their students are glued to this movie). Overall, this was a nice little surprise, and as movies for children go it’s got a lot of heart and intelligence to it, and treats both its subject and audience with a great deal of attention and respect that goes a long way. It’s a good movie for kids to watch because it’s an honest and educational look at history that they can easily get behind, and even adults will be fascinated with how it handles warfare even with its family-friendly limitations, which makes it one of the more ambitious animated films to come out in some time, that wasn’t put out by a major studio. It’ll be interesting to see how it fares outside of America, which is primarily who this movie was made for (after all, it’s about US military history more than others), but as a Brit even I felt moved and patriotic by this movie. Sgt. 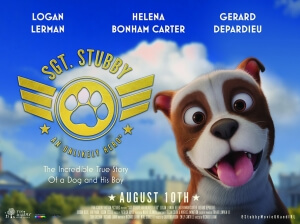 Stubby: An Unlikely Hero is a sweet and wonderfully ambitious animated movie that treats its subject matter and wartime setting with a great deal of respect, proving to be a nice little film for both children and adults.